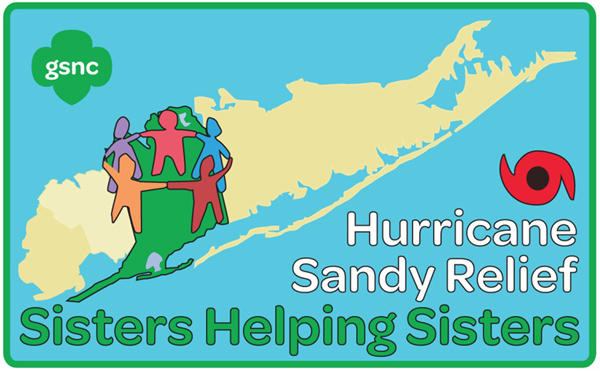 Girl Scouts of Nassau County sends its deepest thanks to our Girl Scout family around the globe who have reached out to us and our Girl Scout sisters who were impacted by Hurricane Sandy. We have been overcome by your generosity, heartened by your ingenuity, and warmed by your prayers and good wishes. We also thank Anna Maria Chavez and the team at Girl Scouts of the USA for their help and support. You all have shown us the Girl Scout Promise and Law in words and deeds! Electricity has been restored to about 90% of the area. But many still share the distress, confusion and suffering of Hurricane Sandy's indelible mark on our community. There is still a sense of malaise and discomfort even as the community pulls together and begins to recover, but the spirit of community is thriving! Most people do have shelter. Many of those hardest hit are with family/friends, some are in just a few rooms of their own home, and some are in temporary housing. While there are some public shelters still open, people are being moved to more stable arrangements as quickly as possible. Girl Scouts are continuing to reach out to those areas that were hardest hit, but communication with those displaced by the storm is still a challenge. Some Girl Scout volunteers have even taken their Leader list and gone door-to-door to contact Leaders and see how Girl Scouts can be of service. In the meantime, we completed a Needs Assessment Survey that is helping us match up those in need with those who have resources to help. It is our hopes that as girls realize that they no longer have their Girl Scout vests, or their books, that they will reach out and contact us. As Troop Leaders see what other Troops are doing, they will be better able to ask for help. And as the Holiday Season approaches, requests may shift to more material or monetary needs. WHAT CAN GIRL SCOUTS DO NOW? Girl Scouts can "be a sister to every Girl Scout" and work to make the world a better place by implementing specific acts of caring and setting bold goals with action plans to match! 1. Continue to keep your hearts and minds open to new ways to reach out to our sisters in need. Remember that the primary "job" of a child is to play. Play, recreation, exercise and fun come right up there at the top of the 'needs' list -- right after love, a hot meal and a warm coat! This goes for every girl, displaced by the storm, or safe and snug at home! 2. "Stuff" is okay, but collecting things may not be the primary need right now. As the holidays approach consider monetary gifts or gift cards that can help families in need 'provide for their own.' $anta will need extra helper$ this year! 3. Work to bring a sense of "normalcy" back to our community ... It is great to just have a regular Girl Scout meeting, work on Journeys and badges, and have some fun! Girls in Troops who are in the areas that were not as hard hit by the storm may want to pair with a Troop who was more severely impacted and plan a fun outing. It could be as simple as a game night or going to a movie together. Think "normal" and FUN -- not expensive or complicated! Also, continue to do those community service activities and Take Action projects that were already in your plans for this year. There is still a world of good that needs doing! 4. Everyone has a story to tell ... and we need to just listen. As you begin to hold meetings again, girls and adults are going to want and need to talk about what has happened. For those girls whose lives have been most disrupted, their stories may be hardest to hear. Allow time for the girls to talk and share, but it is okay to set a time limit so that you can move to the planned activities and the fun. And of course, it is fine if you see that your girls just need a chance to hangout and reconnect with one another. 1. The Girl Scout motto has always been Be Prepared. We'll be looking at ways to help our girls be even more prepared for future emergencies by offering classes and materials for girls, so they will be better prepared to respond the next time the lights go out, or worse! 2. Begin now to set Troop goals for the Girl Scout Cookie Program, which will begin January 5, 2013. Talking about money is always important, and having extra money in your Troop treasury is a really good way to Be Prepared ... when girls need to Take Action, in good times and the worst of times. We thank all our members who quickly stepped forward and recognized that they had hands to help, resources to give or ways to bring back the normalcy that we so need. Our girls, Troops and volunteers have been at the forefront of reaching out to our neighbors in need since the first day after the storm. The road to recovery may be long. Be assured that Girl Scouts will be there to help pave the way and provide opportunities for leadership, respite and fun for all of our girls. Despite the storm, we all have much for which to give thanks ... Wishing all of you more thankful days ahead! In the wake of Hurricane Sandy, many people in Nassau County and all over the country are coming to realize all the things in life that they take for granted… warm meals, heat, electricity, homes, family, caring neighbors, etc. With all that has occurred and with the holiday season approaching, it is important that we give thanks and show appreciation for the things in life that we have. I for one am thankful to have the best job in the world, with the best team ever, doing important work to make the world a better place; I am thankful for my family, my friends, my Girl Scouts, my volunteers, a warm meal at night and a roof over my head. · my co-workers—they are amazing! · the friendship of my Girl Scout family. · my neighbors who came together and helped dismantle the tree in my yard. · to have family, friends and co-workers who are always there to provide support in any way that may be needed. · that through the recent devastation, my family and friends are safe. · for the health and safety of family and friends. · The amazing people I have met through Girl Scouts, especially the volunteers. Many are Girl Scout sisters I will have for the rest of my life. · my family and friends. · all the gifts Girl Scouts of Nassau County has given me, taught me and allowed me to share with others. · the power of numbers… and ice cream. · the love of my family and friends. · my family, friends, and the things I used to take for granted—warmth, light, freedom from want. · the love of my family and the friends I have made through Girl Scouting. · my new job at Girl Scouts. I love being part of such a great organization; changing the world, one woman at a time! · my neighbors, my friends, my family, and my Girl Scout family. · a job that keeps me intellectually stimulated. · laughter of those around me—kids, family, co-workers, and friends. · the kindness of the staff and membership in reaching out to help people in the community. · family and dear, dear friends that got us through the past few weeks! They are always there… we just notice more now! · the outpouring of help, kindness and love I have seen and heard of to help our community begin to cope with the devastation. I am Thankful for the leaders and other volunteers who are checking on their girls and their communities, and for those who are finding ways for girls to support each other – and even to share a little fun in being together, helping girls perhaps be a little less afraid. I would bet that each of our girls and families – regardless of how the storm impacted them – has also reached out to make things better for someone else…and that spirit of giving is what I am most Thankful for! · all of our community supporters. First and foremost, check on the other Girl Scouts in your Troop and in your Association. See if there is anything they need. Start a collection of baby food, diapers and wipes. Start a supply drive. Many shelters and organizations are in need of diapers, formula, food, water, household cleaners and personal care items. Create Shelter Activity Kits for Kids or bring books and craft supplies, such as construction paper, crayons, coloring books, glue and scissors to local shelters so that the children at these shelters have something to do. Sign up as a volunteer through the Long Island Volunteer Center, Island Harvest, American Red Cross and other local organizations. damage to Camp Blue Bay. Remember, just because the storm is over, doesn’t mean that people no longer need help! Volunteering and Community Service is important during all seasons of the year. The Girl Scouts of Nassau County office reopened on Monday November 5. Our electricity and internet service has been restored. We didn’t suffer any damage to our building. However, Camp Blue Bay didn’t fare so well. Several trees were destroyed; there was severe damage to the platform tents and polls and they are still without electricity. Like true New Yorkers, many have reached out to us asking how they can help Girl Scouts in Nassau County. We are still assessing the needs of girls and their families. We know that several communities are still without electricity and many families have significant damage to their homes. The loss of homes along coastal communities has been devastating. We know that Girl Scout families have been deeply impacted. And it will take many months before they can return home or find permanent housing. As families try to move forward, we want them to know that we are here to support them. Normalcy for those who are homeless is far off, but we want them to know that Girl Scouts is still available for them. We have created the Girl Scouts of Nassau County Hurricane Relief Fund that will help get Troops up and running; replace uniform components, Journey books and Girls Guide to Girl Scouting books; to provide scholarships for program and camp participation; and restore damage to Camp Blue Bay. You can assist our efforts by clicking here and making a donation to the Girl Scouts of Nassau County Hurricane Relief Fund. Over the next few weeks will continue to assess the needs in our Council. Updates will be available on our web-site. You can also contact Luci Duckson-Bramble, Chief Fund Development Officer for additional information, at 516-741-2550 ext 208 or lduckson@gsnc.org or Donna Ceravolo, Executive Director/Chief Executive Officer, at 516-741-2550 ext 200 or ceravolo@gsnc.org.